The hour of fading light after the sun has set  magic hour  is treasured by photographers; the quality of the soft light depends on the weather, the season, and the location, but it always informs the feel of the photograph in its specificity. Twilight: Photography in the Magic Hour, is not about photography at twilight, but rather about photography of twilight, of the moods that have come to be associated with the liminal moment between day and night. This book and the recent exhibit at the V&A, edited and curated by Martin Barnes and Kate Best, are an effort to describe the cultural resonance of twilight as evidenced in recent photography, bringing together the work of eight photographers for whom the suggestion of twilight (or in the case of Liang Yue, muted light, and for Boris Mikhailov, muted prints) informs the narrative tone of the pictures. This task is easier said than done, not least because twilight, while evocative, nonetheless evokes many different ideas and feelings. However, the effect of the book is powerful and provocative due to an interesting argument supported by exceptional photography, and excellent supporting essays. Gregory Crewdson and Philip-Lorca diCorcia add artificial light to twilight to create pictures that deploy two very different kinds of cinema language: Crewdson calls up one set of cinematic references to twilight with larger than life magical realist tableaux while diCorcia evokes the look and feel of realist “New Hollywood” movies of the 1970s in which twilight opened up a moment of loneliness and uncertainty. 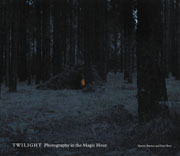 For both photographers, twilight suggests a moment of possibility and self-consciousness, as it does in Bill Henson’s portraits at the moment at which twilight surely becomes night, in Ori Gersht’s pictures of sublime evening skies overwhelming city skylines, and in Chrystel Lebas’ panoramic images of light falling in forests. In Lebas and Henson’s pictures, and in Liang Yue’s series of a distant figure holding a warm signal lamp in cityscapes overcome by the haze of dust storms, the awareness of possibility hovers between anticipation and dread.